If you want to take a look at your pictures, you can start a slideshow. After a few seconds, the next photo will be shown. 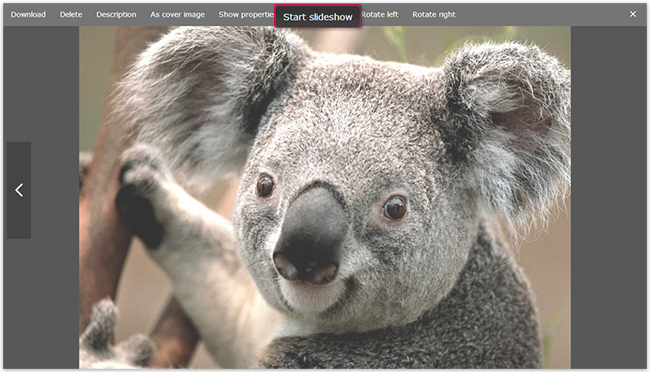 In a slideshow, you can easily view your photos without having to click through all of them yourself. The next photo simply appears after a couple seconds. Click the photo you want to start the slideshow with. This image is shown in a dark border. In the Actions menu, click Start slideshow. The slideshow starts automatically and shows all images one after another. Next step: To end the slideshow, press the Esc key on your keyboard. I cannot log in to my account. How do I reach the Premium Phone Support? © 2019 1&1 Mail & Media Inc. All rights reserved.